Escrow is the safest way to buy high value items online. Rather than your money going directly into the seller’s account, it is held by a third-party in an Escrow account until you are happy with your purchase and release the funds. We’ve developed a new and innovative payment system with our payment partners Assembly, to protect you. You are in control. You can cancel at any time. We just didn’t feel comfortable with the standard ecommerce arrangements. The International jewellery industry needed something better. An Escrow service means that you are not reliant on the seller to refund your money, should you be unhappy with your purchase. When you agree to purchase an item, your money is sent into an escrow account. We cannot access it in any way until you release the funds. 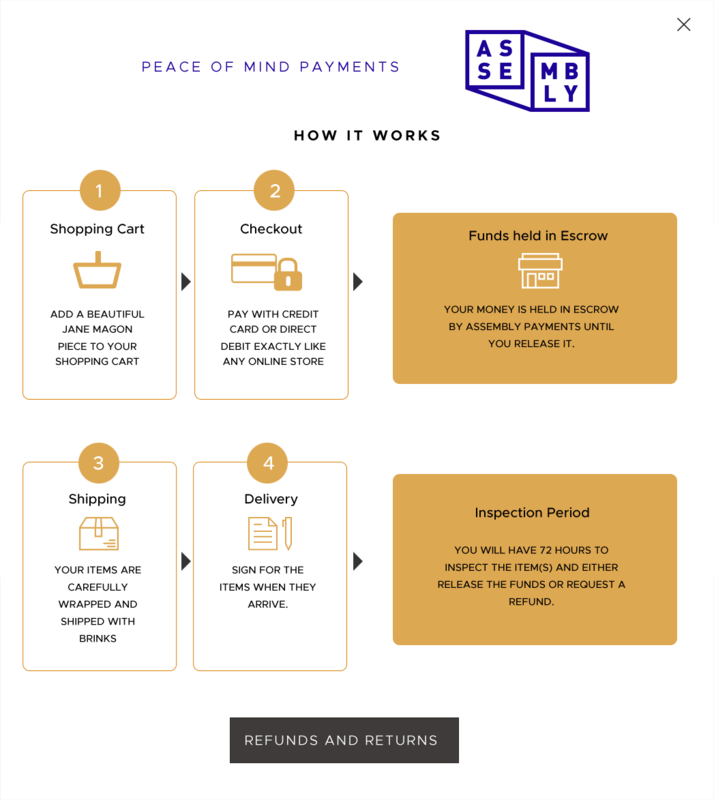 We trust Assembly Payments to handle all our transactions. Assembly Payments are based in Australia, but operate globally. They manage online transactions for some of the worlds largest companies including Gumtree and Airtasker. During the establishment of the escrow agreement Assembly Payments will need to know who we both are. There will be time to confirm identifications on both sides of the agreement. Failure to provide ID confirmation or sufficient identification will result in a terminated transaction. This will occur before any funds are transferred. We want you to be completely satisfied with your purchase, take 24 hours to inspect the piece to make sure it is exactly what you ordered. You can cancel the order anytime up until that date. You will know when your jewellery is arriving, so make sure you have someone organised that can help you inspect the piece within the 24 hour period. If you are unhappy with the piece or it is damaged in transit, let us know immediately. We’ll arrange to send it back. Once we receive and confirm the piece, your funds will be released from Escrow. See full Refund Policy for more details.